20 May 2015. The dancers dart and glide between the patterns of falling and rising juggling clubs, gently varying their steady geometry. These airy diamonds hold the dance momentarily in a live force field. Then there is flow and escape. The violins, viola, cello, and double bass make a harmonious landscape of sound to move in; faces and bodies glow with energy and delight. And we hear the voices of the players; rhythmic speech matching their careful steps and balletic moves, catching and releasing. Sometimes there is an intense and emotional pairing. Then the group joins in and a wider set of links and bonds unfurl in limbs and throws and colours. Juggling hoops turn into wings, turn into halos, turn into dresses of splendour. Loose and endless falling and rising of white circles up there in the dark steady the mind, while below the human arrangements endlessly revolve and evolve. There is love and knowledge of the spaces between each person, other people. We see just how close you can get and still make a beautiful pattern. Then it shifts and breaks into something new. It makes you wonder how this moving marvel is made. 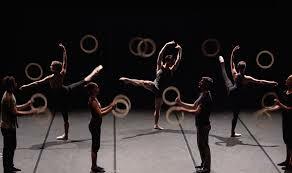 This entry was posted in Reviews and tagged 4x4, Ballet, Gandini Juggling on June 24, 2015 by Joy L. Martin.